Final General Meeting for 2017, at The Castlefield Centre, 505 Bluff Road, Hampton,, Followed by an end-of-year celebratory supper and raffle. The raffle raised $118, and the sale of aprons and skirts that Catherine had made raised $17. The total ($135) was donated to Anne Moon’s Fund to help disadvantaged asylum seekers who are seeking protection. Many thanks to everyone who was involved on the night. Once again we meet on the concourse of the beautiful State Library. It is Human Rights Day, and we have come to town to give a voice to the people on Nauru and Manus, and to demand that Australia accept more Rohingyan refugees. It is a perfect day, weatherwise, and as always the crowd is very peaceful and relaxed. With others, I hold a long banner that says ‘Bring the refugees to safety NOW’, and listen to the various speakers who tell us about the current situation for those languishing at Australia’s whim. By my estimation, there must be only about two thousand protesters, if that. It is a poor turn out. Today’s rally didn’t seem to be promoted well. Where are the priests, the rabbis, and the imams? What about the families of refugees who came to Australia through the decades, the Greeks, the Italians, the Jewish people, the Vietnamese, etc., etc. They are here in small numbers, but they should be here in their masses. What has happened to the union movement, which used to lead the community on social issues? The CFMEU, the AWU, CEPU and other unions were once a driving force of public demonstrations. I am here today, to keep the conversation alive, and to show those in detention that there are still Australians who care about them. It is my hope that in some small way my action today will eventually bring about change for a more compassionate policy on the handling of refugees. The Staging Post follows two Afghan Hazara refugees, Muzafar and Khadim. Stuck in Indonesia after Australia ‘stopped the boats’ and facing many years in limbo, they built a community and started the school which inspired a refugee education revolution. This was a very special evening. About 100 people attended to watch this uplifting film about a group of Hazara refugees living in perpetual limbo at a ‘Staging Post’ in Cisarua, Indonesia. Instead of accepting their fate of being virtual prisoners in a foreign land, they decided, as a community, to take charge of their plight and, without experience or tools, decided to form the CLRC (Cisarua Refugee Learning Centre) to educate the many refugee children. Despite its very humble beginnings in 2014, the school instantly became the driving force for the whole community, a symbol of pride and achievement the school now boasts 7 classrooms, 12 teachers, 6 administration staff and nearly 200 students. After the film, the audience was given the opportunity to ask questions to the film Director, Jolyon Hoff, and the Co-founder of the CRLC. This was followed by a Skype with some of the school community. It was a very insightful evening, and the warmth of the audience was very apparent in their applause. Tuesday 21 November 7.30 p.m.
Anne was a former aid worker with Australian Volunteers International who served in many conflict zones such as East Timor and Aceh. But nothing prepared her for the conditions she was to find on Manus Island. Her involvement began when she saw asylum seekers being forced into buses and sent to remote islands. She heard the stories about people with life-threatening diseases, epilepsy, diabetes and heart disease being denied their medication. This prompted her to become active in calling for offshore detention to stop. It soon became clear to her that writing, calling and visiting politicians’ offices was not enough. At her presentation at St Leonard’s Church Brighton on 24 November, Anne spoke with great credibility. We thought we knew how bad things were on Manus, but we had no idea of HOW bad they were. Those who were at the presentation discovered new and very disturbing facts about dreadful sleeping conditions heat, mosquitoes, filthy toilets, foul, unappetising and unwholesome food, constant video surveillance, even in showers and toilets, endless waiting in tropical heat or downpours for everything from food to medication to a daily ration of toilet paper! Also Anne provided evidence of abhorrent verbal abuse, punitive deprivation of medication and gravely needed medical treatment, bashings, targeted bullying and unrelenting humiliation of detainees by staff. She revealed that many detainees have post traumatic stress disorder from their experiences on Manus, and many have attempted suicide. She is particularly concerned for those who received negative assessments to their application for refugee status as she believes that the process was flawed, and relevant information was not taken into consideration. All decent Australians feel deep shame at the atrocities that continue to be committed in our name in the offshore detention centres. We must not ABANDON refugees in PNG. Give these people the dignity, safety and freedom they deserve. The response from the public was very positive, and around 4000 postcards were returned! A great effort by all. 2. Communication between applicants, agents, the Department of Immigration and Border Protection, and refugee advocacy and support groups. 3. Visa processing and how it can be improved. 4. The role of the Department of Immigration and Border Protection. 5. What can be done to improve the situation. Following the presentation, Graham answered questions. “Too many agents/lawyers are lodging applications, which have little or no chance of success. In many cases, the applications are so poorly prepared, that the agent/lawyer really should be referred to the OMARA (Office of the Migration Agents Registration Authority). Unfortunately, too many clients fear this will have an adverse effect on their application. Some Migration Agents/Lawyers also misuse and abuse the AAT (Administrative Appeals Tribunal) process, by submitting applications which they know will not be successful, simply as a means of “stalling the inevitable”. It is little wonder that the Department (and the applicants) get so frustrated. For the second year running BRASA held an information stall at The Sandringham Village Festival. The main purposes were to inform the public about our aims, and to publicise our upcoming events. A most important collaboration was with “Grandmothers Against Detention of Refugee Children” who shared our stall. They had a marvellous opportunity to interact with the public and sell bottles of delicious chutney made at the Geelong “Australians For Refugees” shop. A most enjoyable part of the event was inviting children to participate in the lucky dip: this allowed the volunteers to communicate with their parents while the children opened their gifts. Catherine’s mini cup-cakes that were iced and decorated were very popular. Her handmade tutus sold very well. BRASA made $277 from the day, and gained some new friends who asked to be included on our mailing list. Thanks to Catherine, Kate, Guy, Judy and the Grandmothers for making the day such a great success. We’ll be back next year. Sri Samy was the guest speaker at BRASA’s General Meeting of 12 October. I found her talk very thought-provoking, and I came away inspired by this amazing woman. In 2012, the late sports journalist Trevor Grant and Sri Samy an architect from India worked together on the Tamil Refugee Council. Both Trevor and Sri were dismayed to find that many people from various backgrounds who were seeking asylum in Australia, were living in absolute poverty without even basic household items such as beds or a fridge. Trevor and Sri approached many agencies for help but all were facing funding cuts and could not offer assistance. As a young woman who had recently married, Sri had left her friends and family and come to Australia with her husband. It was difficult at first for she knew no-one, but she soon found work in her profession. The experience of being uprooted from her family in India and coming to a strange land allowed her to empathise with the plight of refugees. Five years after her arrival in Australia, tragedy struck when Sri and her husband lost their first child at birth. In the following months Sri lost her father and her father-in-law. The next year was joyful for Sri gave birth to a second child; their daughter, Krisha. Together, Trevor and Sri established ‘Friends of Refugees,’ and the organisation has become central source of first-line relief for people seeking asylum in Melbourne’s south east. Their services include material aid, food aid, education support, job training and resettlement programs. This fabulous concert involving artwork and music by refugees and other talented people was a roaring success. It raised $6613 for the Human Rights Law Centre. Photo kindly provided by Michelle Bennett. Presentation of cheque for $6613.00 to Hugh de Kretser, C.E.O. of the Human Rights Law Centre. L-R Amy Frew, Daniel Webb, Greg Jones, Geraldine Moore, Hugh de Kretser, Lydia Sherren and Rev. Kim Cain. On 12 May BRASA members enjoyed a night out with the chefs and volunteer staff of Tamilfeast who were celebrating the second birthday of their award-winning enterprise. Above left: Sriharan and Niroshan, right, Nirmathan, Dori and Nigethan. Katie, a nurse who formerly worked on Nauru, addressed an after work rally on the shortcomings of the medical service for asylum seekers detained on Nauru. Promac Productions, Greg Jones of Waterjet Reaction and the BRASA team raise money for the Asylum Seeker Resource Centre. Jo Gumley, Community Fundraiser of the Asylum Seeker Resource Centre receives a symbolic cheque from Geraldine Moore, President of BRASA from the proceeds of the highly successful charity performance of “Lanza Sings Again”. Greg Jones (far left) who organised the event looks on. Soprano Alison Jones (green dress) and tenor Roy Best (bow tie) as well as pianist Len Forster and compere Chris McKenna delighted 180 people on Saturday 4th February at the Brighton Town Hall. The ASRC’s Material Aid program provides practical, material items to hundreds of people seeking asylum who are living inMelbourne and experiencing financial hardship and destitution. Many asylum seekers do not have the right to work and are ineligible for financial support such as Centrelink. The ASRC provides asylum seekers with a hearty cooked meal each day at lunchtime, and a variety of essential items including bedding, nappies for babies, international calling cards, cooking equipment, mobile phones and Myki credit. They have a team of approximately 40 lawyers who provide free legal advice. Their support program also builds and maintains relationships with external agencies. They provide referral pathways to other aid organisations that can help to meet the needs of asylum seekers. 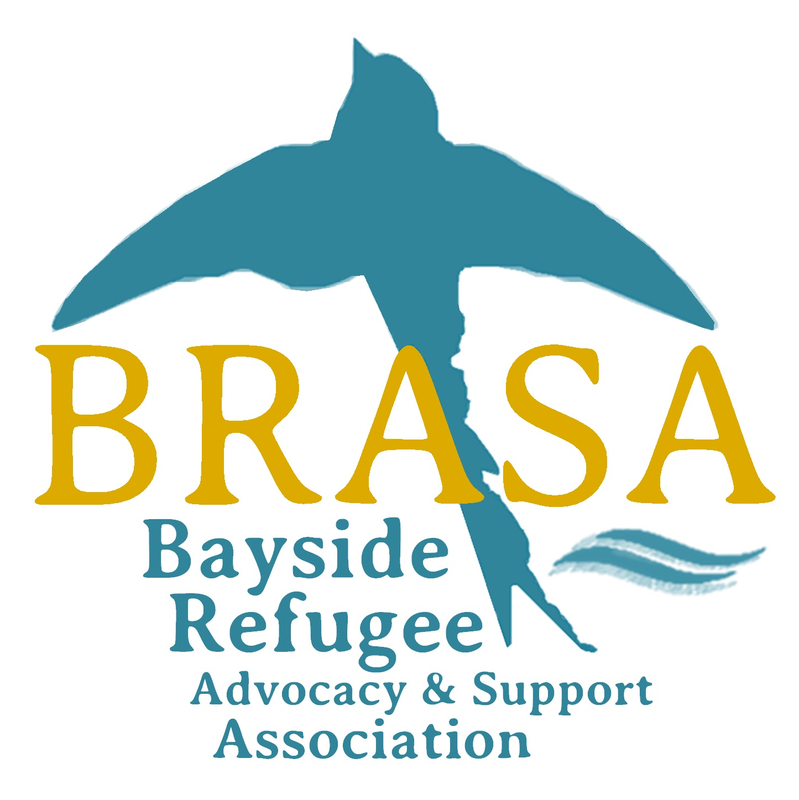 With your help BRASA hopes to raise funds to assist the ASRC in this essential work.